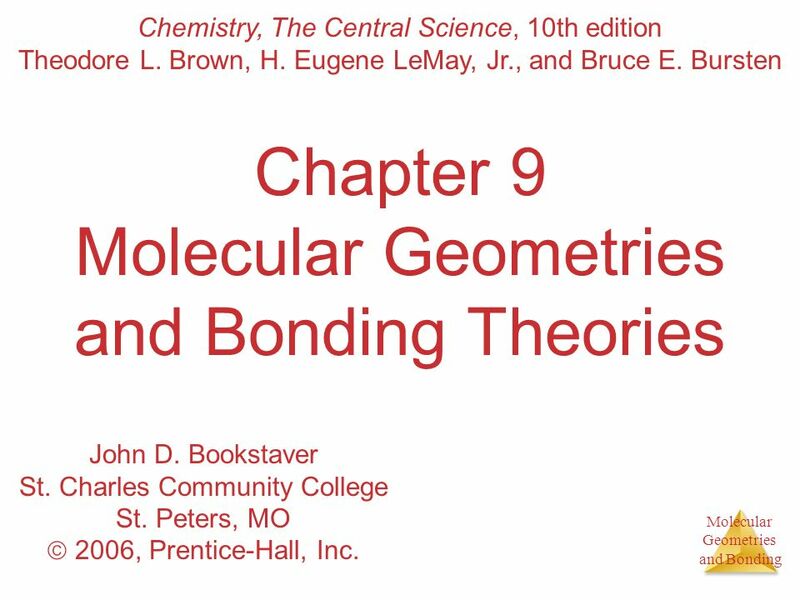 Chemistry, The Central Science, 10th edition Theodore L. Brown, H. Eugene LeMay, Jr., and Bruce E. Bursten Chapter 9 Molecular Geometries and Bonding Theories John D. Bookstaver St. Charles Community College St. Peters, MO  2006, Prentice-Hall, Inc.
2 What Determines the Shape of a Molecule? 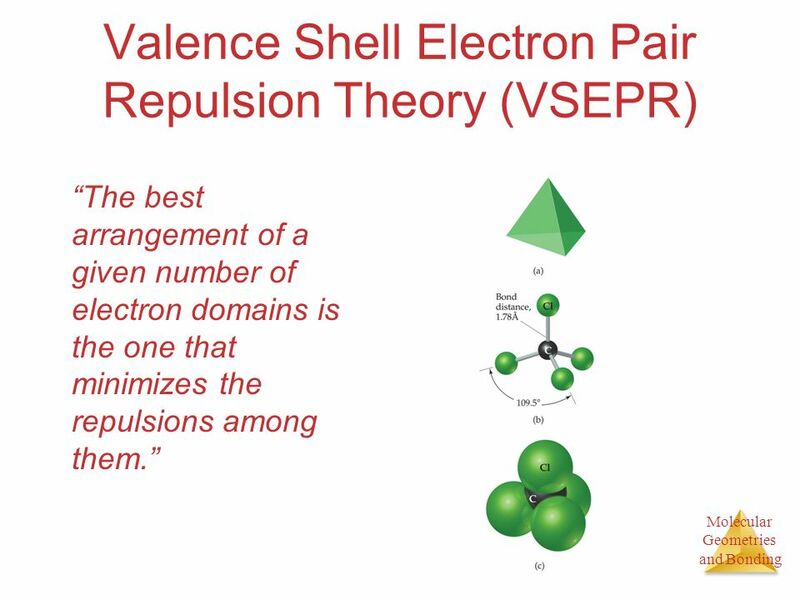 Simply put, electron pairs, whether they be bonding or nonbonding, repel each other. 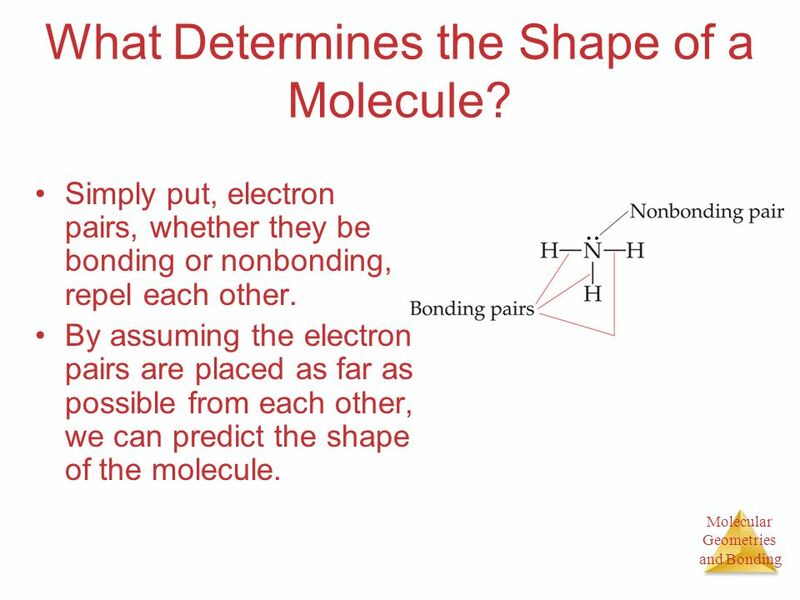 By assuming the electron pairs are placed as far as possible from each other, we can predict the shape of the molecule. 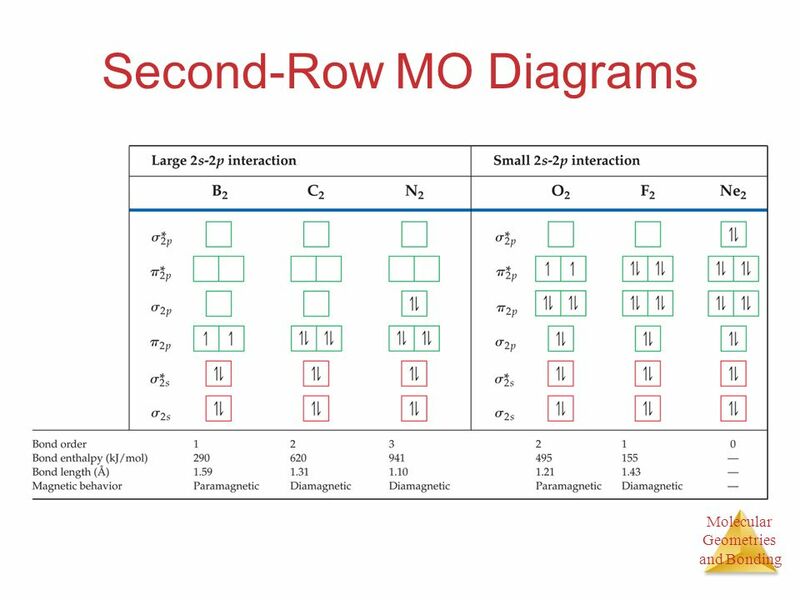 3 Electron Domains We can refer to the electron pairs as electron domains. 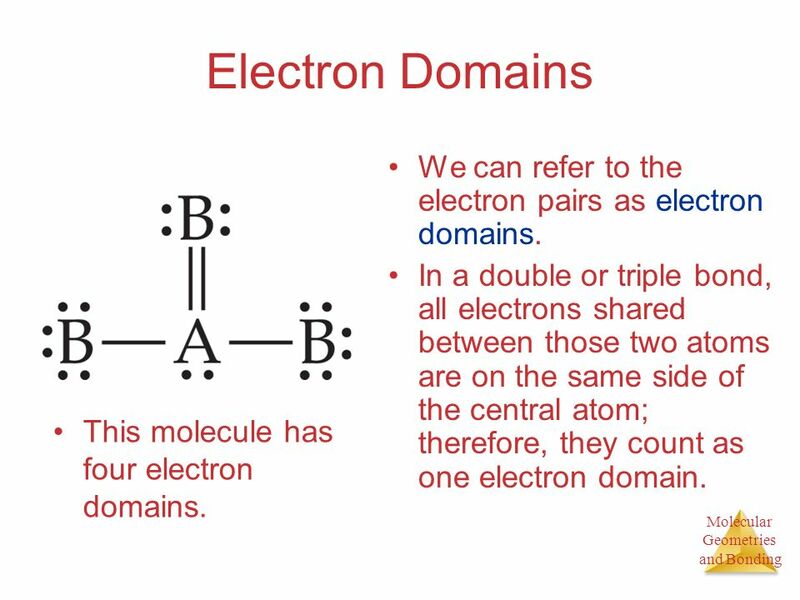 In a double or triple bond, all electrons shared between those two atoms are on the same side of the central atom; therefore, they count as one electron domain. This molecule has four electron domains. 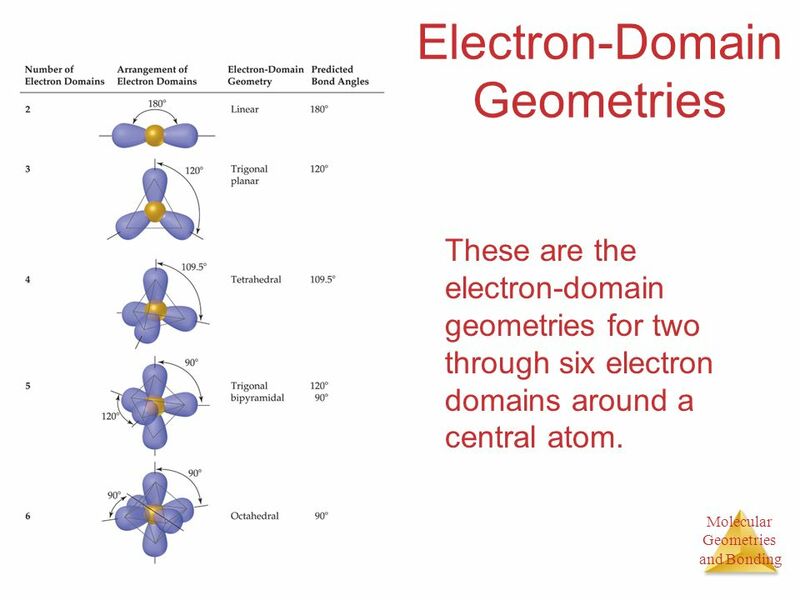 These are the electron-domain geometries for two through six electron domains around a central atom. 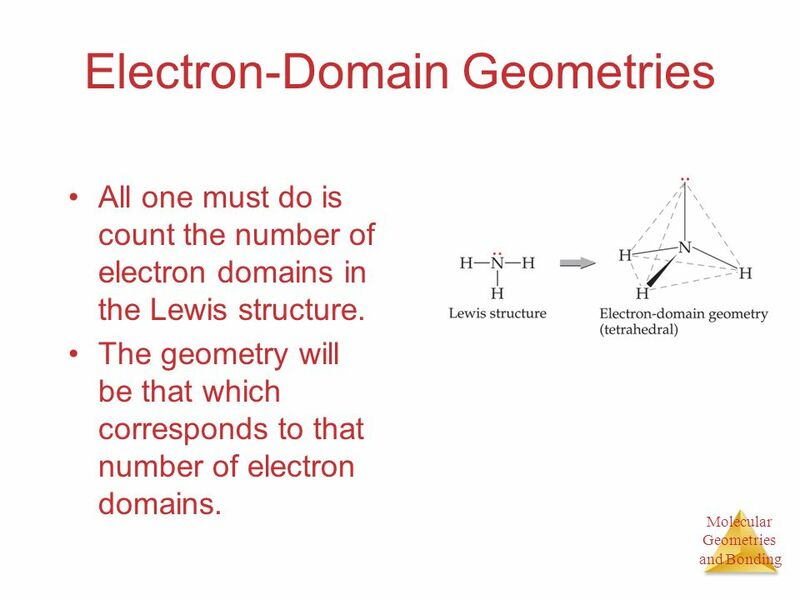 All one must do is count the number of electron domains in the Lewis structure. The geometry will be that which corresponds to that number of electron domains. 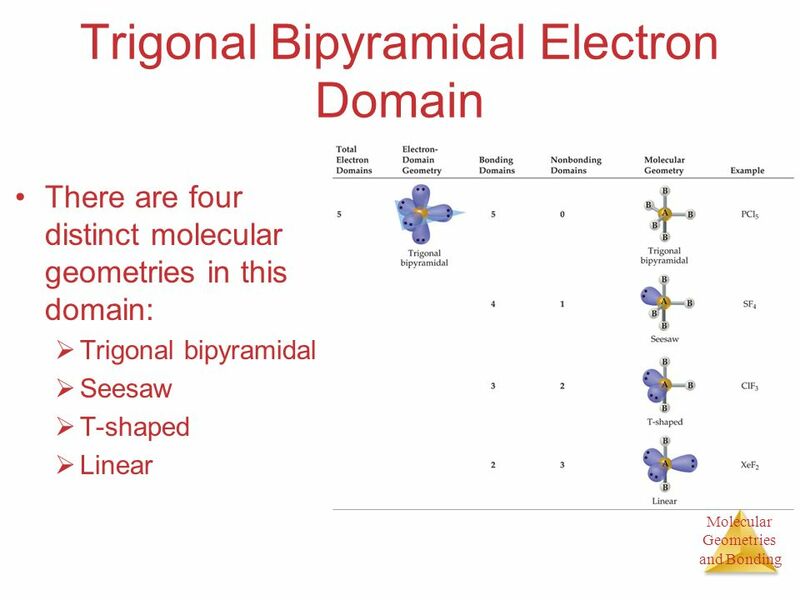 7 Molecular Geometries The electron-domain geometry is often not the shape of the molecule, however. The molecular geometry is that defined by the positions of only the atoms in the molecules, not the nonbonding pairs. 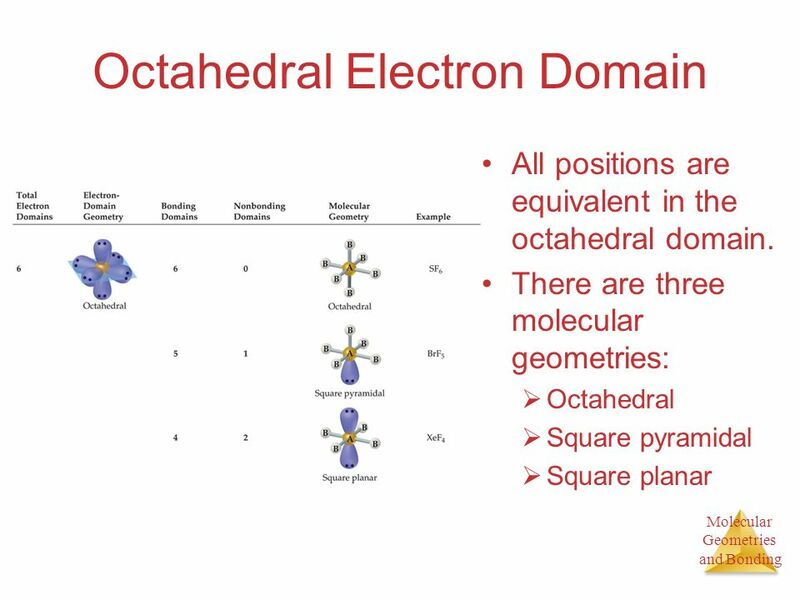 8 Molecular Geometries Within each electron domain, then, there might be more than one molecular geometry. In this domain, there is only one molecular geometry: linear. 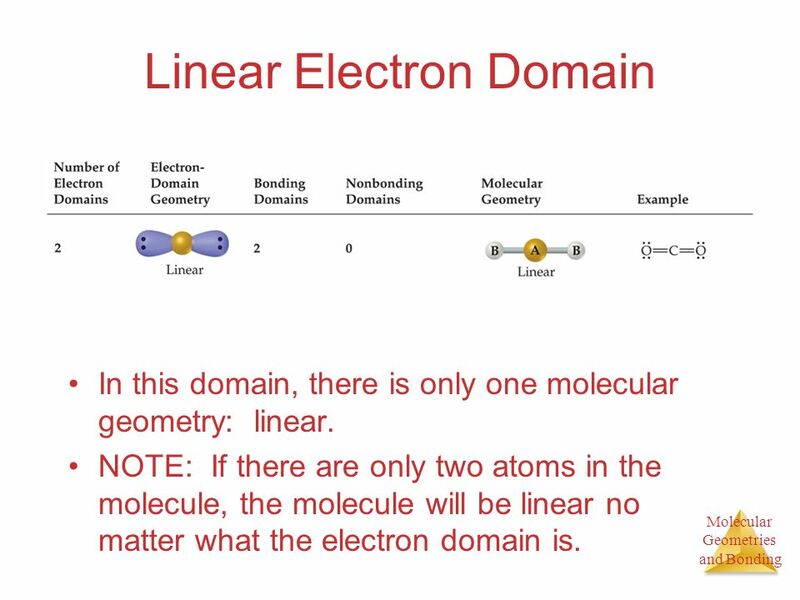 NOTE: If there are only two atoms in the molecule, the molecule will be linear no matter what the electron domain is. 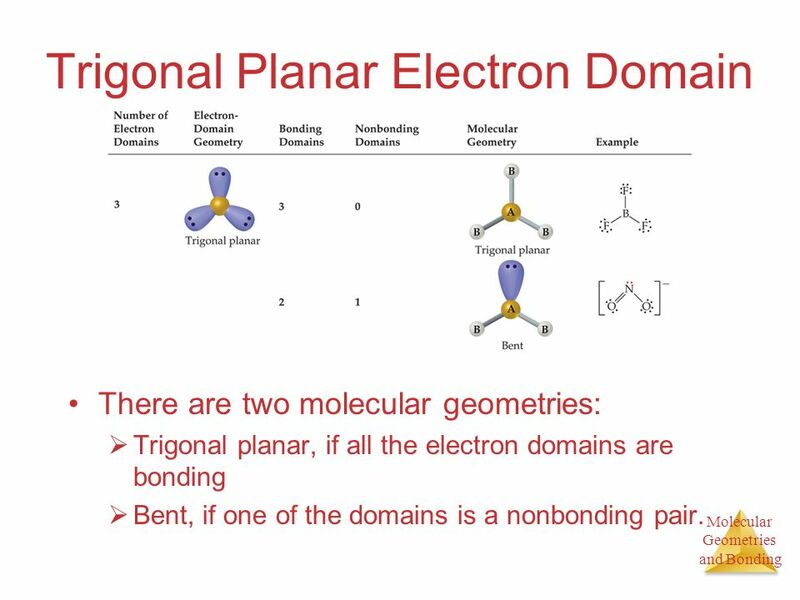 There are two molecular geometries: Trigonal planar, if all the electron domains are bonding Bent, if one of the domains is a nonbonding pair. 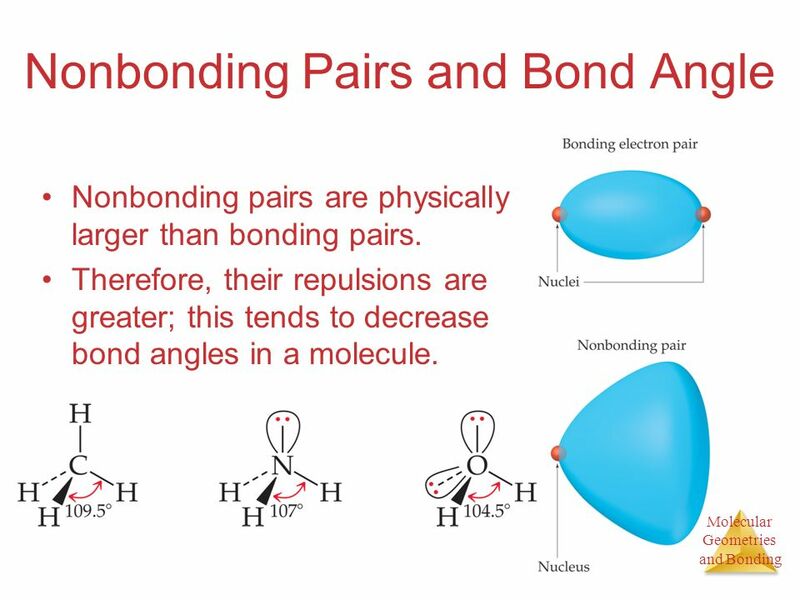 Nonbonding pairs are physically larger than bonding pairs. Therefore, their repulsions are greater; this tends to decrease bond angles in a molecule. 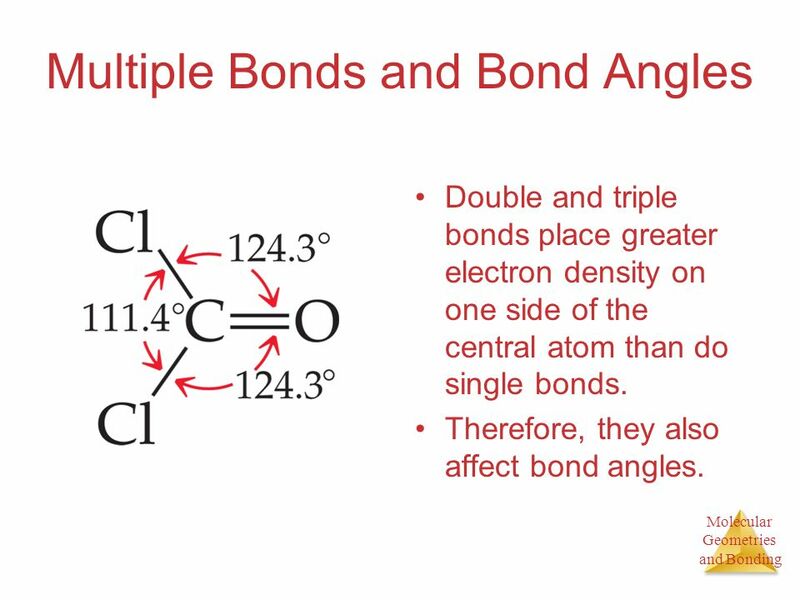 Double and triple bonds place greater electron density on one side of the central atom than do single bonds. Therefore, they also affect bond angles. 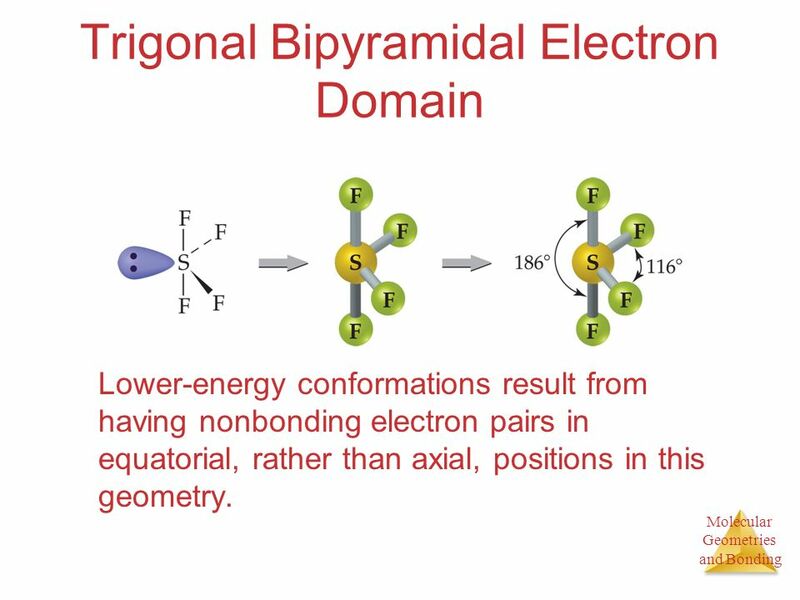 Lower-energy conformations result from having nonbonding electron pairs in equatorial, rather than axial, positions in this geometry. 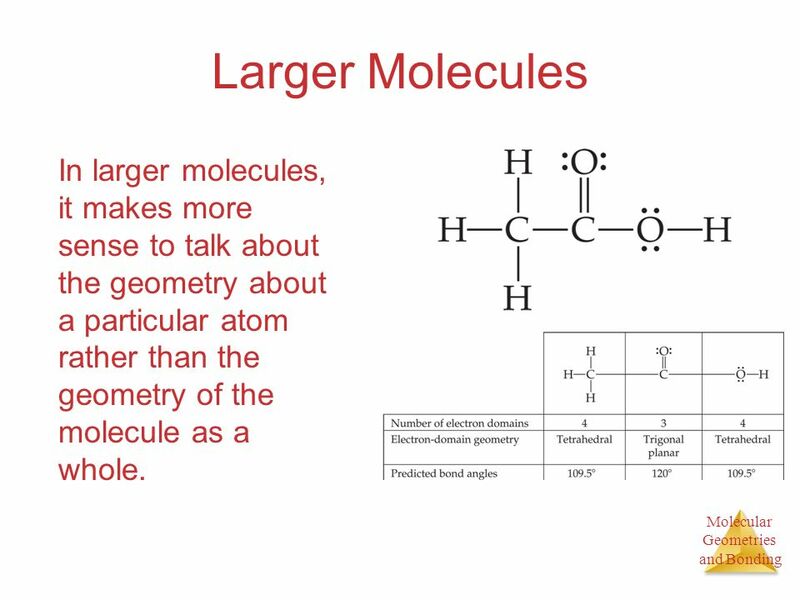 18 Larger Molecules In larger molecules, it makes more sense to talk about the geometry about a particular atom rather than the geometry of the molecule as a whole. 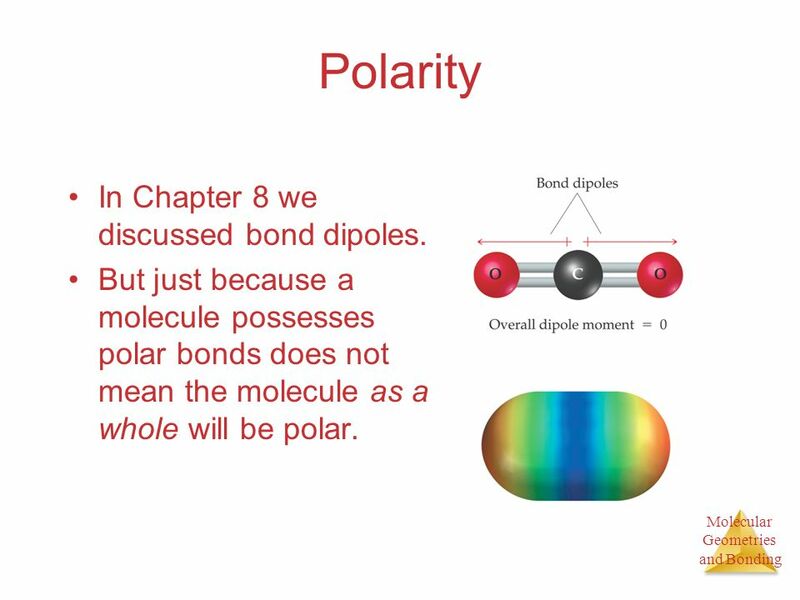 19 Polarity In Chapter 8 we discussed bond dipoles. But just because a molecule possesses polar bonds does not mean the molecule as a whole will be polar. 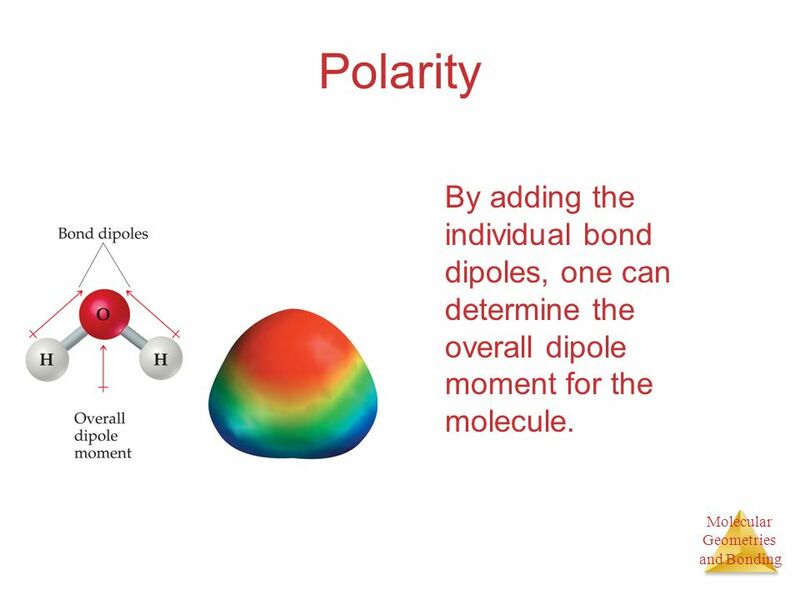 20 Polarity By adding the individual bond dipoles, one can determine the overall dipole moment for the molecule. 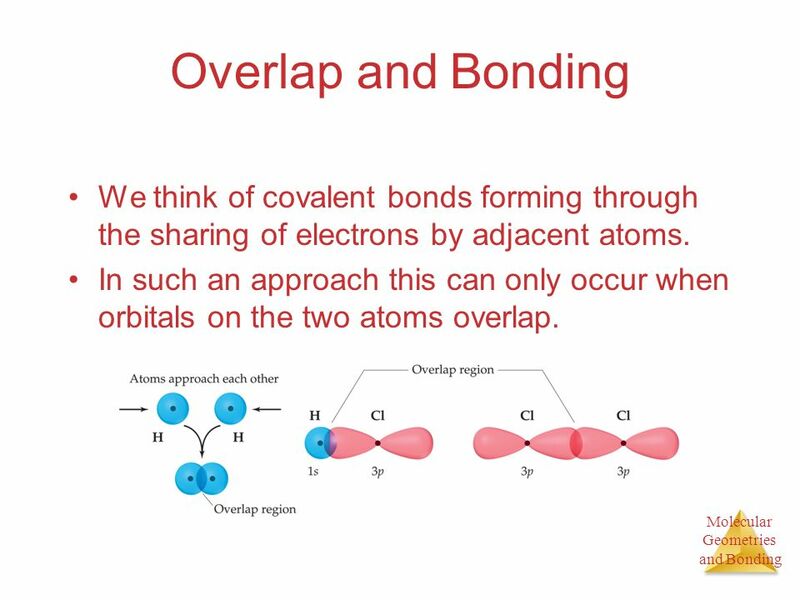 22 Overlap and Bonding We think of covalent bonds forming through the sharing of electrons by adjacent atoms. In such an approach this can only occur when orbitals on the two atoms overlap. 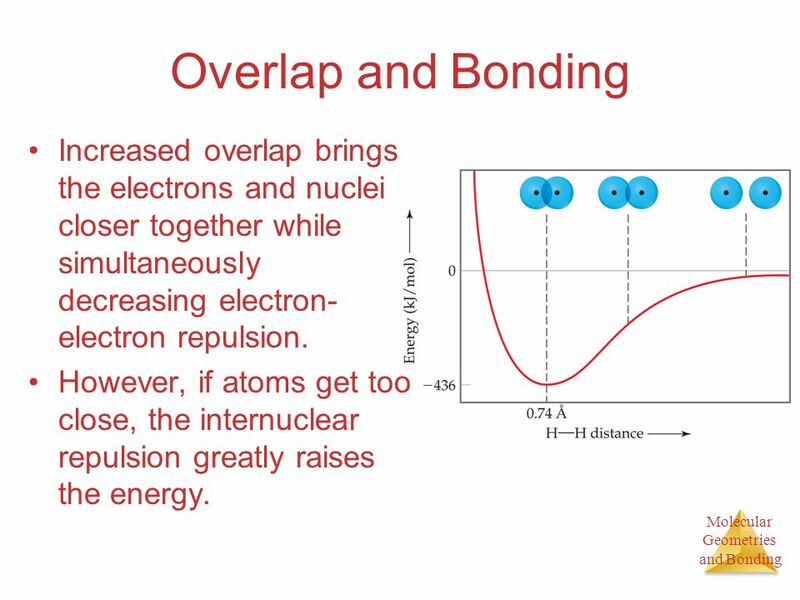 23 Overlap and Bonding Increased overlap brings the electrons and nuclei closer together while simultaneously decreasing electron-electron repulsion. However, if atoms get too close, the internuclear repulsion greatly raises the energy. 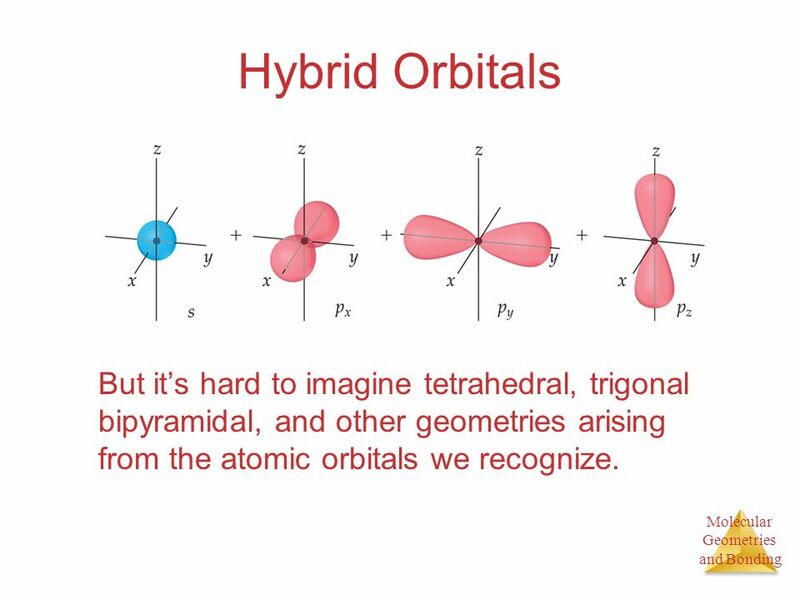 24 Hybrid Orbitals But it’s hard to imagine tetrahedral, trigonal bipyramidal, and other geometries arising from the atomic orbitals we recognize. In its ground electronic state, it would not be able to form bonds because it has no singly-occupied orbitals. 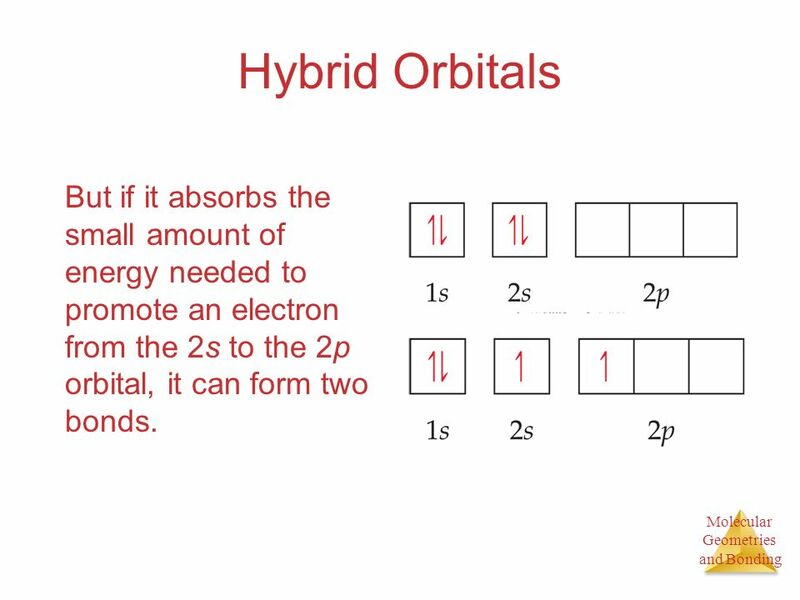 26 Hybrid Orbitals But if it absorbs the small amount of energy needed to promote an electron from the 2s to the 2p orbital, it can form two bonds. 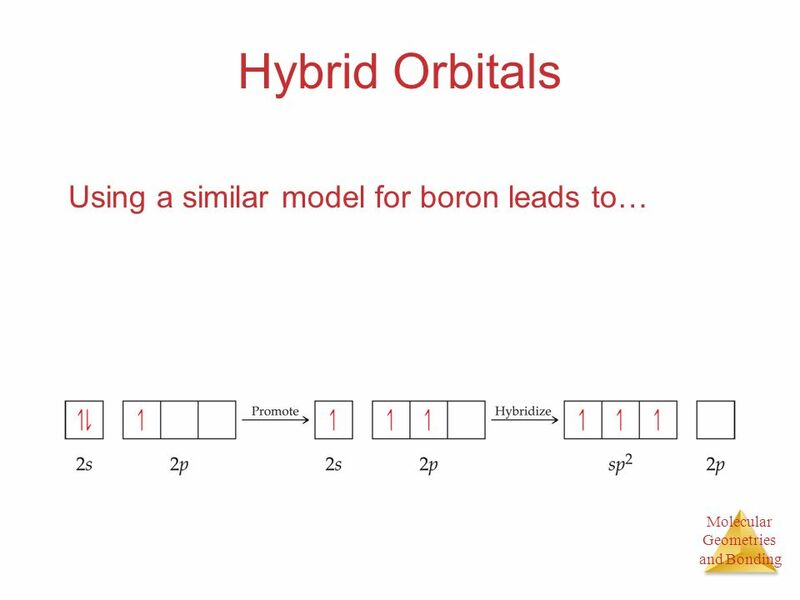 27 Hybrid Orbitals Mixing the s and p orbitals yields two degenerate orbitals that are hybrids of the two orbitals. 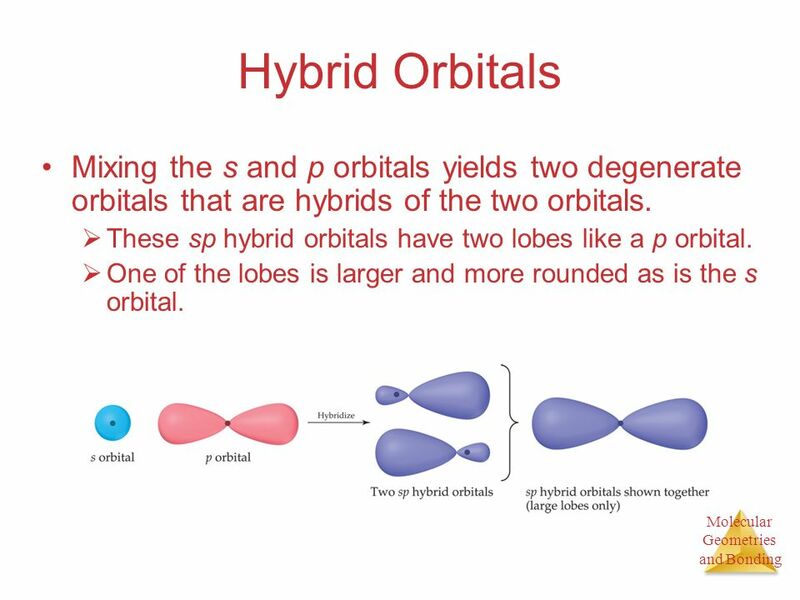 These sp hybrid orbitals have two lobes like a p orbital. One of the lobes is larger and more rounded as is the s orbital. 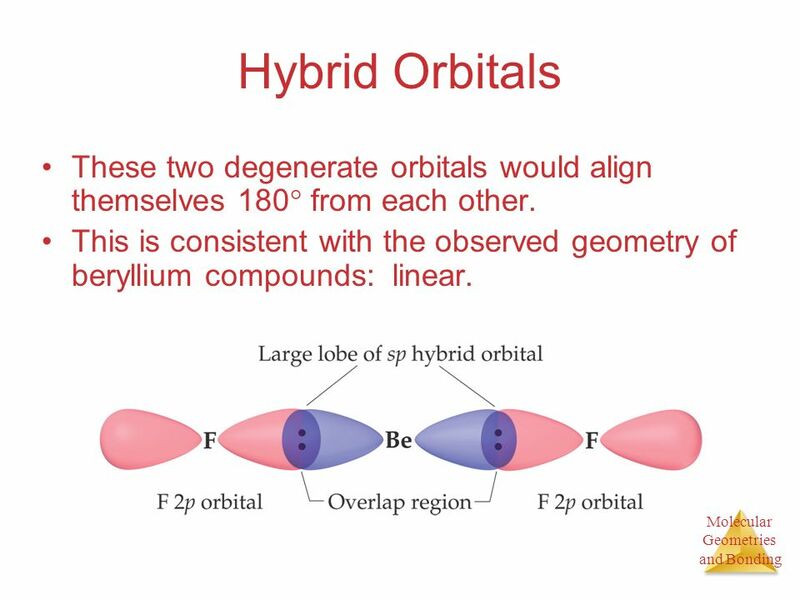 28 Hybrid Orbitals These two degenerate orbitals would align themselves 180 from each other. This is consistent with the observed geometry of beryllium compounds: linear. 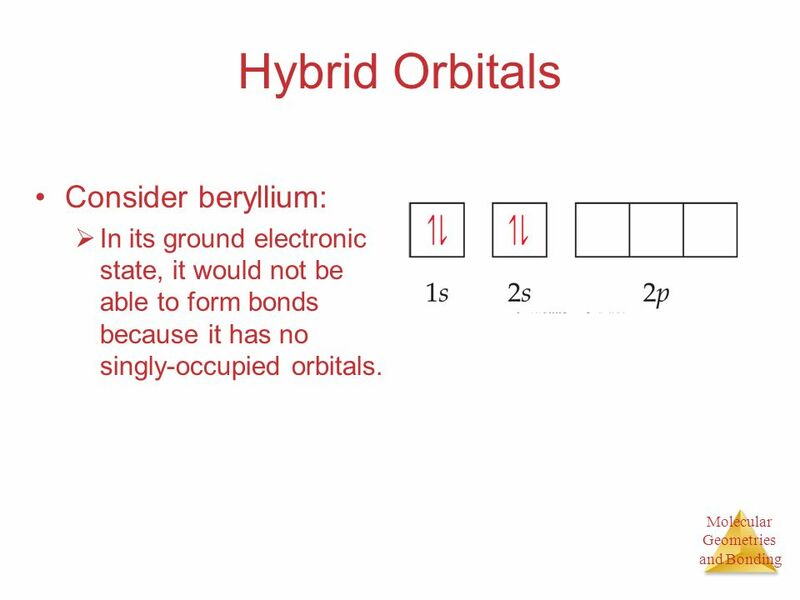 29 Hybrid Orbitals With hybrid orbitals the orbital diagram for beryllium would look like this. 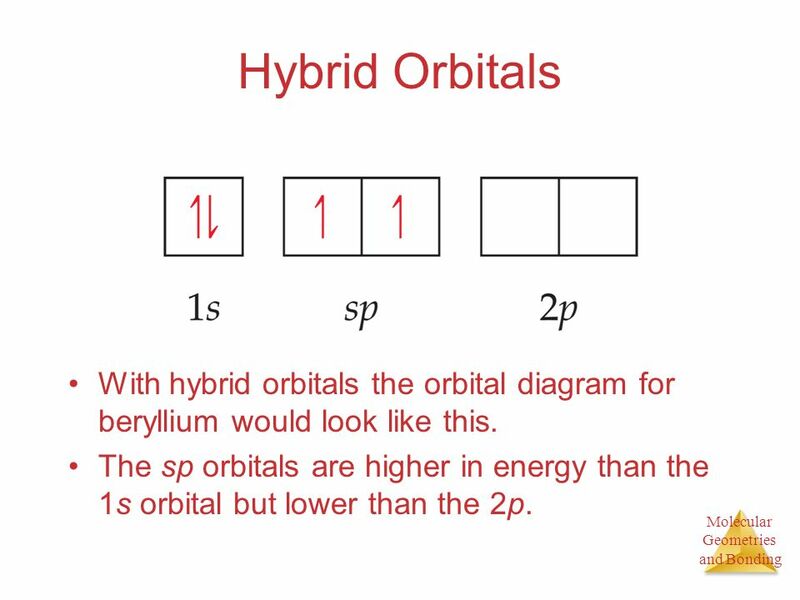 The sp orbitals are higher in energy than the 1s orbital but lower than the 2p. 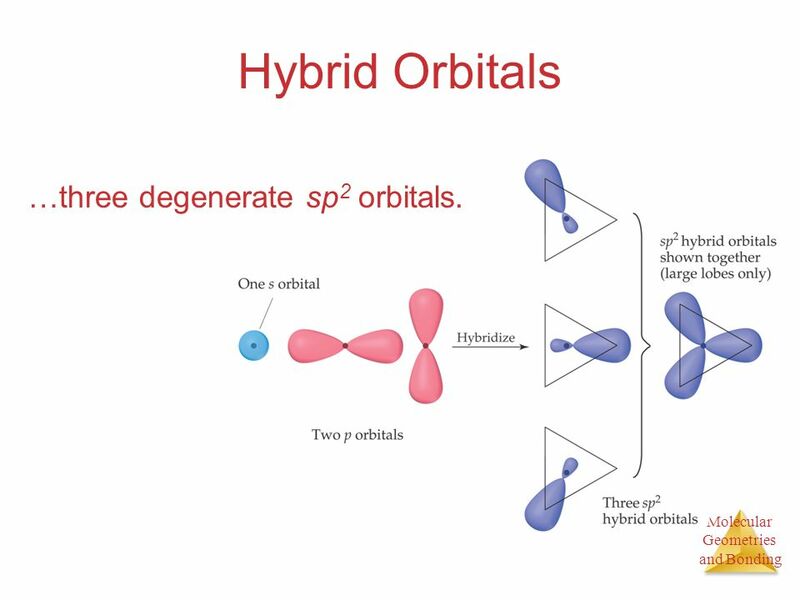 31 Hybrid Orbitals …three degenerate sp2 orbitals. 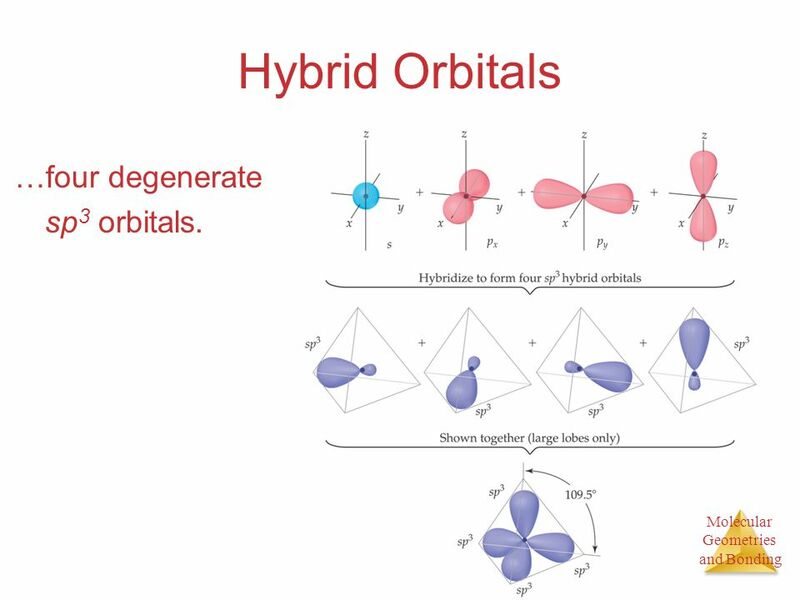 33 Hybrid Orbitals …four degenerate sp3 orbitals. 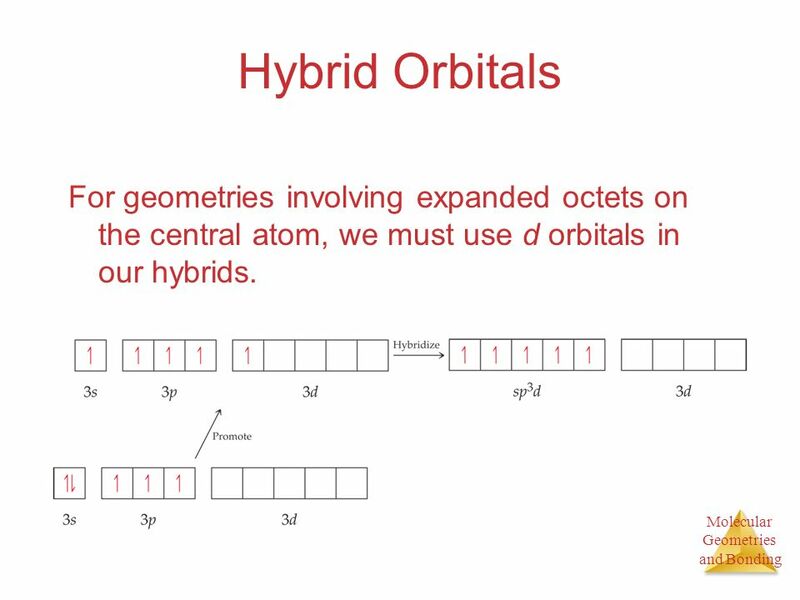 34 Hybrid Orbitals For geometries involving expanded octets on the central atom, we must use d orbitals in our hybrids. 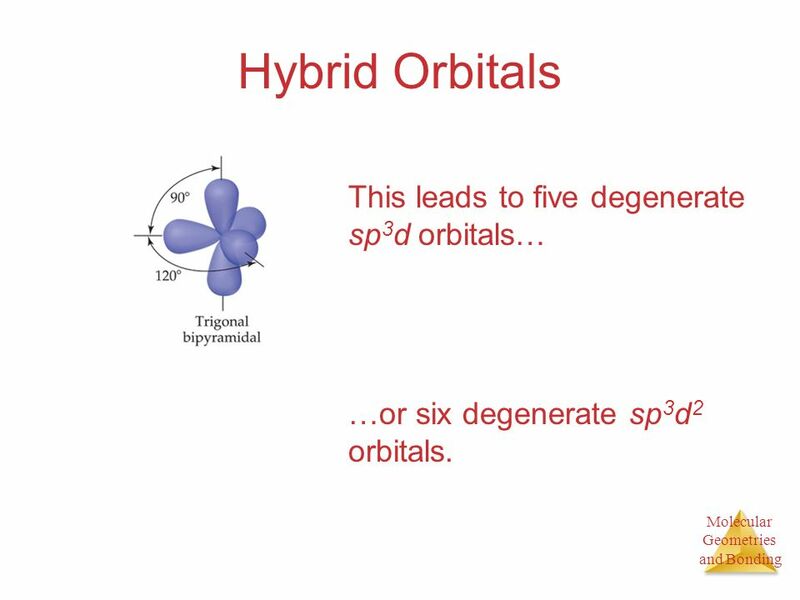 …or six degenerate sp3d2 orbitals. 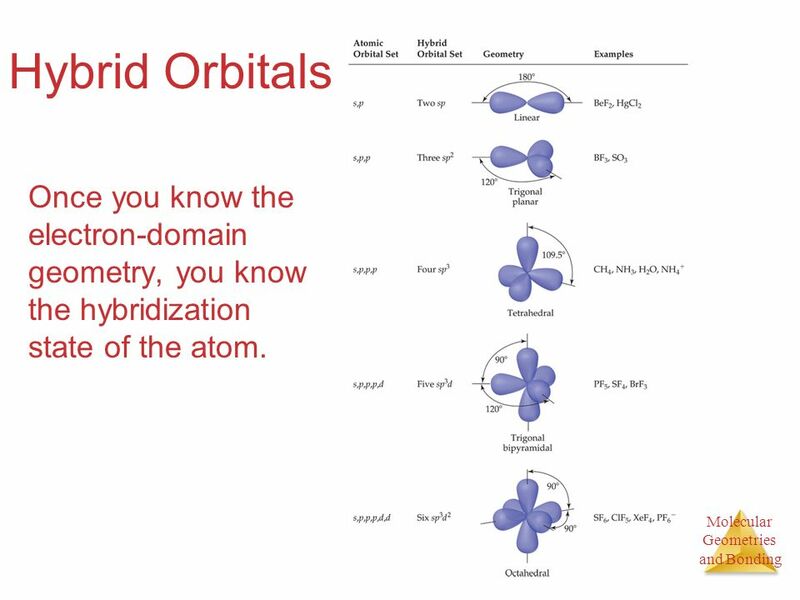 36 Hybrid Orbitals Once you know the electron-domain geometry, you know the hybridization state of the atom. 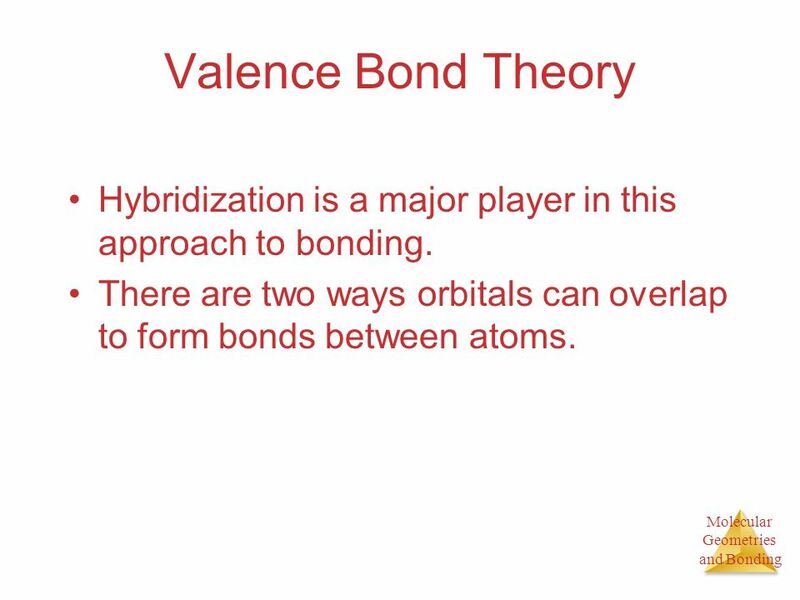 37 Valence Bond Theory Hybridization is a major player in this approach to bonding. There are two ways orbitals can overlap to form bonds between atoms. 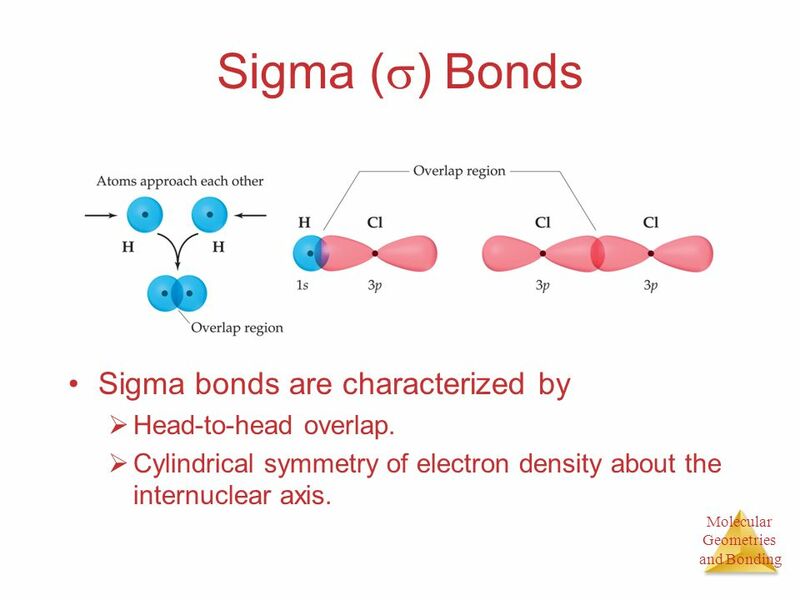 38 Sigma () Bonds Sigma bonds are characterized by Head-to-head overlap. Cylindrical symmetry of electron density about the internuclear axis. 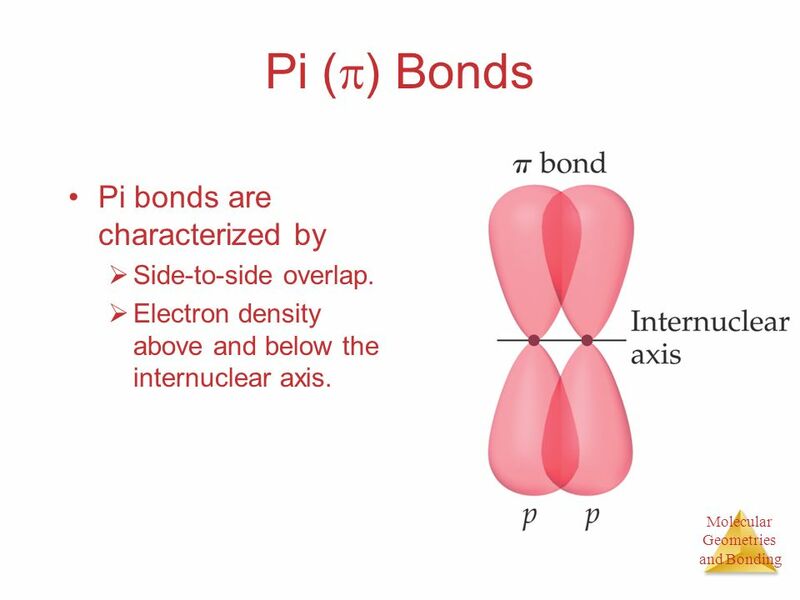 39 Pi () Bonds Pi bonds are characterized by Side-to-side overlap. Electron density above and below the internuclear axis. 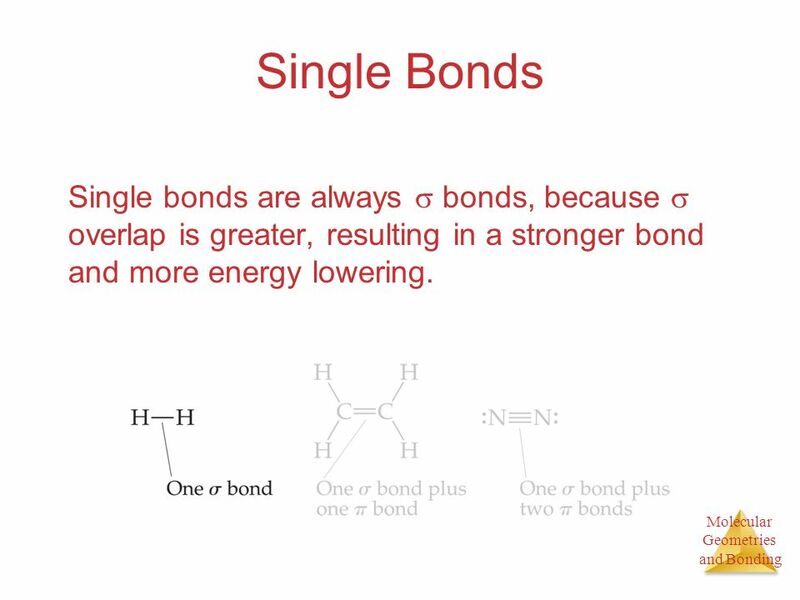 40 Single Bonds Single bonds are always  bonds, because  overlap is greater, resulting in a stronger bond and more energy lowering. 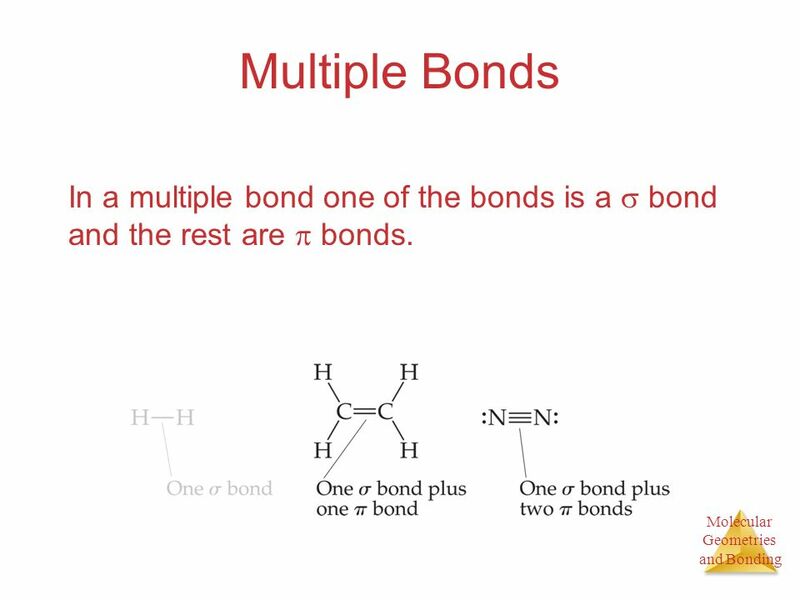 41 Multiple Bonds In a multiple bond one of the bonds is a  bond and the rest are  bonds. 42 Multiple Bonds In a molecule like formaldehyde (shown at left) an sp2 orbital on carbon overlaps in  fashion with the corresponding orbital on the oxygen. The unhybridized p orbitals overlap in  fashion. 43 Multiple Bonds In triple bonds, as in acetylene, two sp orbitals form a  bond between the carbons, and two pairs of p orbitals overlap in  fashion to form the two  bonds. 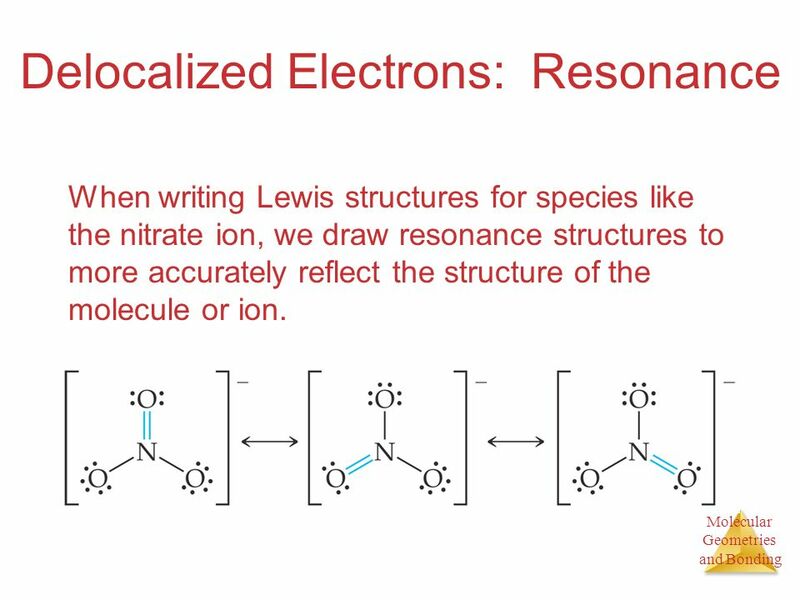 When writing Lewis structures for species like the nitrate ion, we draw resonance structures to more accurately reflect the structure of the molecule or ion. 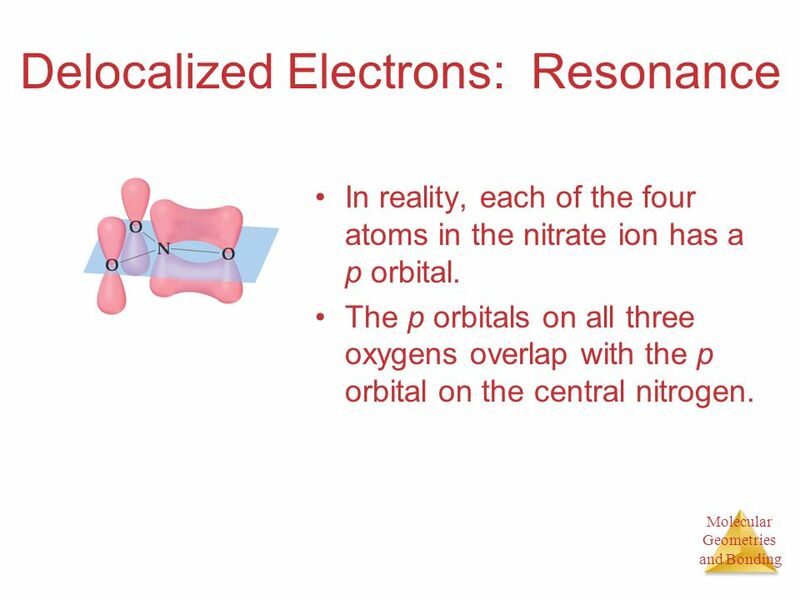 In reality, each of the four atoms in the nitrate ion has a p orbital. The p orbitals on all three oxygens overlap with the p orbital on the central nitrogen. 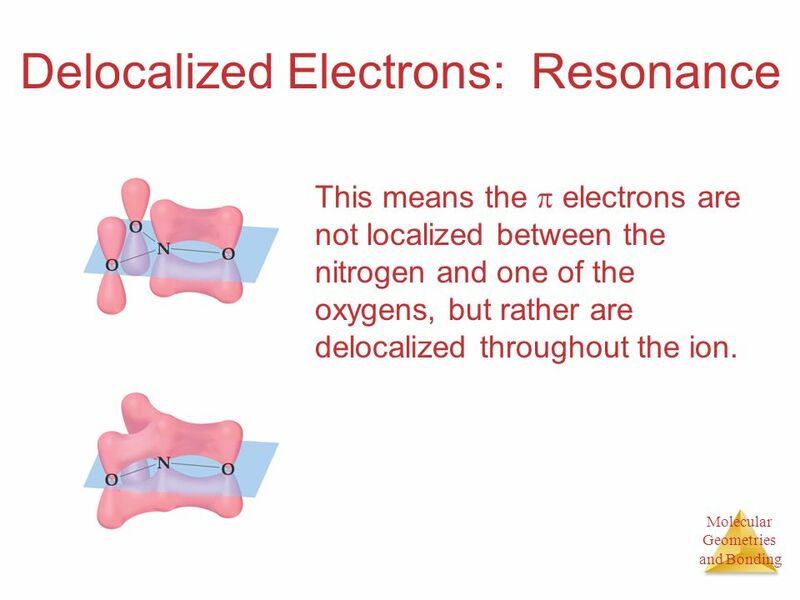 This means the  electrons are not localized between the nitrogen and one of the oxygens, but rather are delocalized throughout the ion. 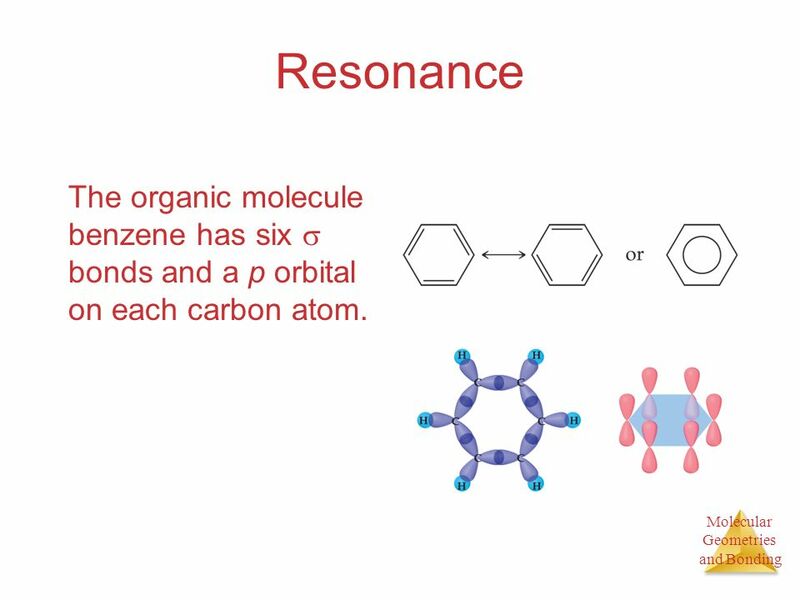 47 Resonance The organic molecule benzene has six  bonds and a p orbital on each carbon atom. 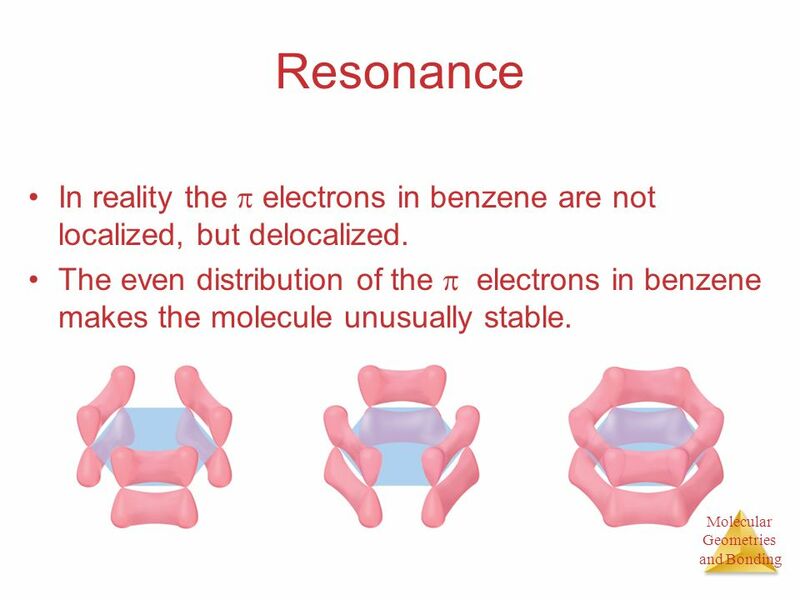 48 Resonance In reality the  electrons in benzene are not localized, but delocalized. The even distribution of the  electrons in benzene makes the molecule unusually stable. 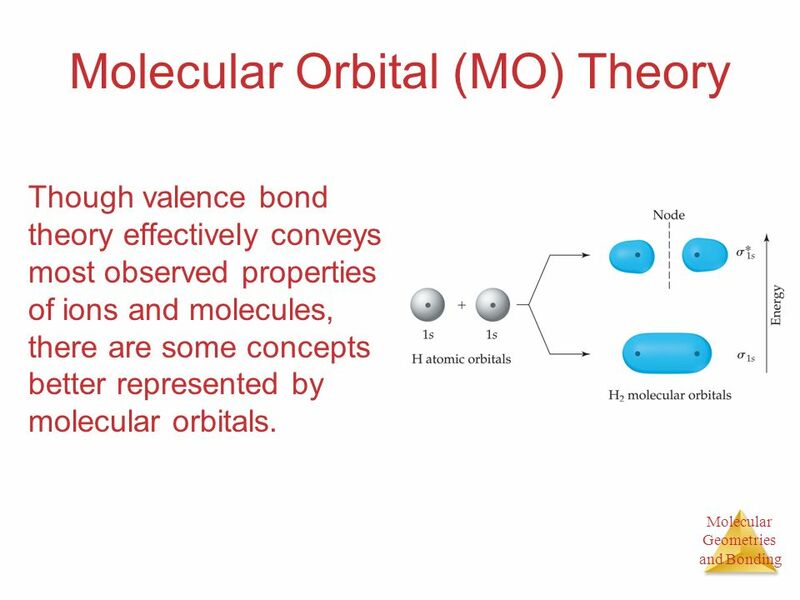 Though valence bond theory effectively conveys most observed properties of ions and molecules, there are some concepts better represented by molecular orbitals. 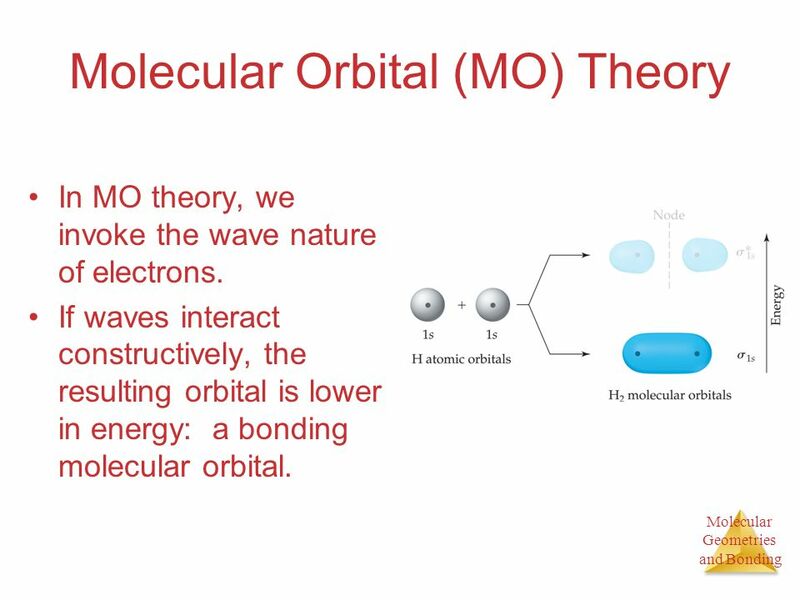 In MO theory, we invoke the wave nature of electrons. 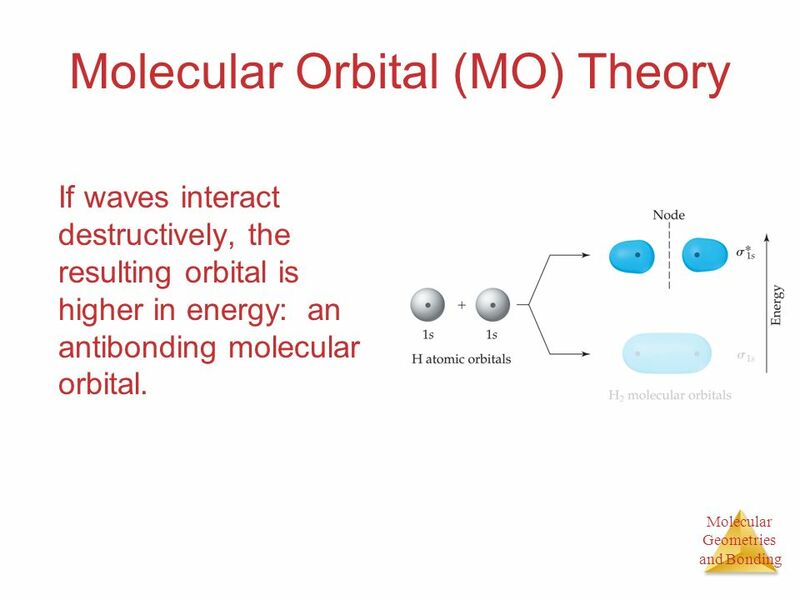 If waves interact constructively, the resulting orbital is lower in energy: a bonding molecular orbital. If waves interact destructively, the resulting orbital is higher in energy: an antibonding molecular orbital. 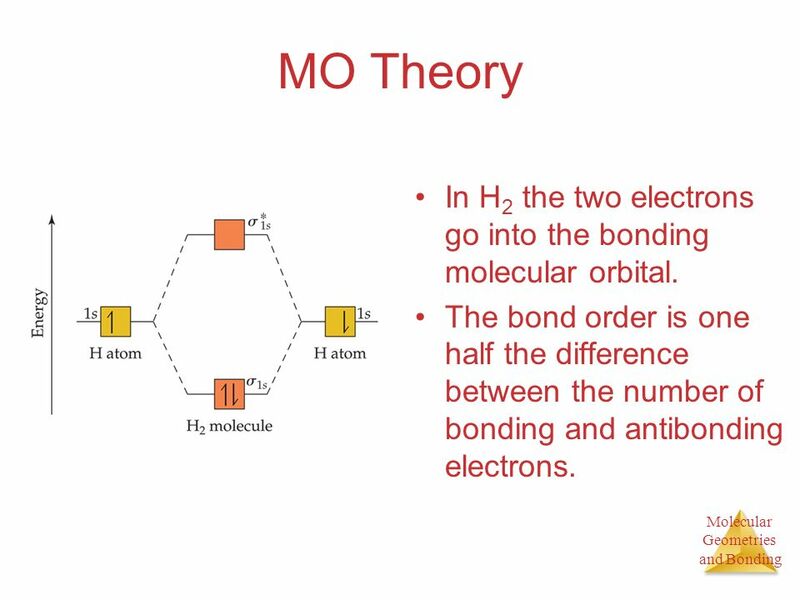 52 MO Theory In H2 the two electrons go into the bonding molecular orbital. 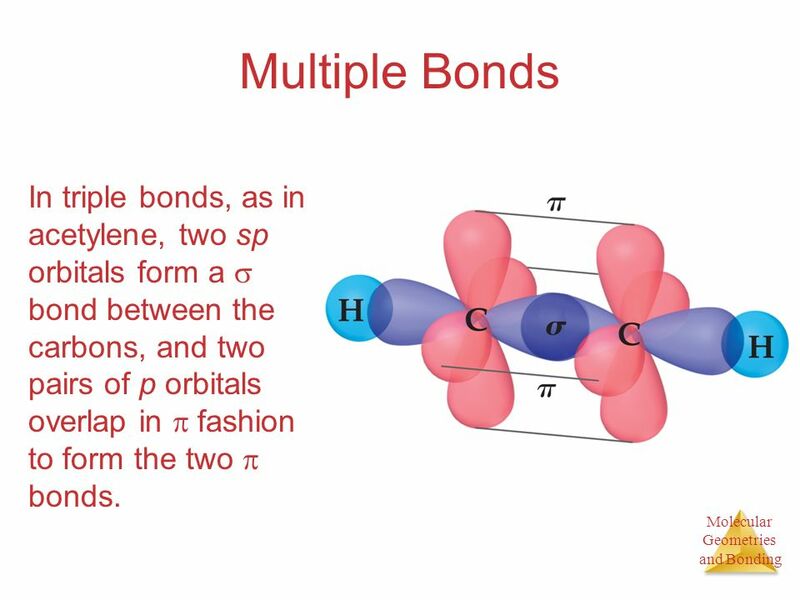 The bond order is one half the difference between the number of bonding and antibonding electrons. Therefore, He2 does not exist. 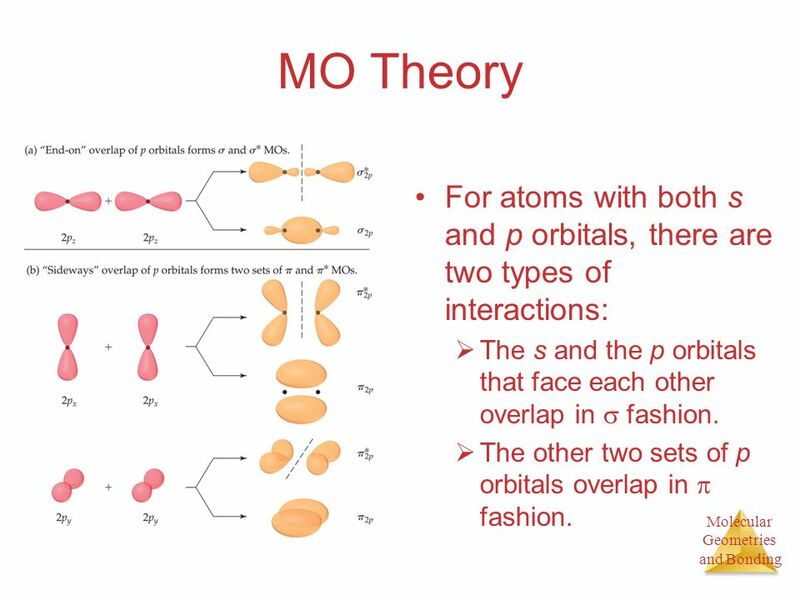 55 MO Theory For atoms with both s and p orbitals, there are two types of interactions: The s and the p orbitals that face each other overlap in  fashion. The other two sets of p orbitals overlap in  fashion. 56 MO Theory The resulting MO diagram looks like this. There are both s and p bonding molecular orbitals and s* and * antibonding molecular orbitals. 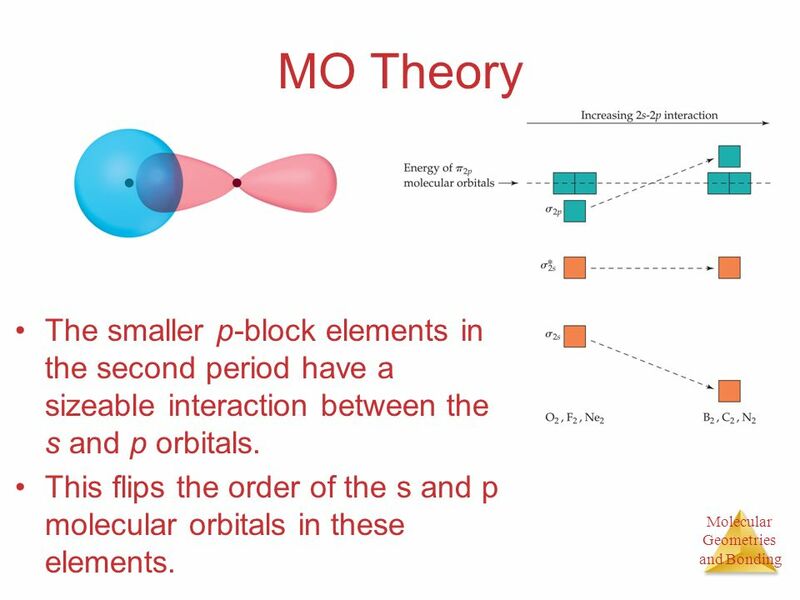 57 MO Theory The smaller p-block elements in the second period have a sizeable interaction between the s and p orbitals. This flips the order of the s and p molecular orbitals in these elements. 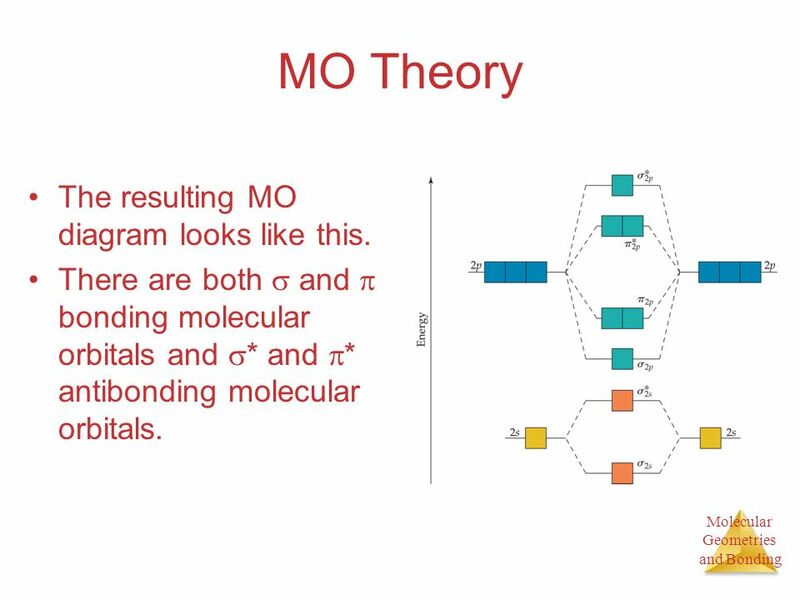 Download ppt "Chapter 9 Molecular Geometries and Bonding Theories"
Molecular Geometries and Bonding Theories. Molecular Shapes The shape of a molecule plays an important role in its reactivity. The shape of a molecule. AP Chapter 9 Molecular Geometry and Bonding Theories. 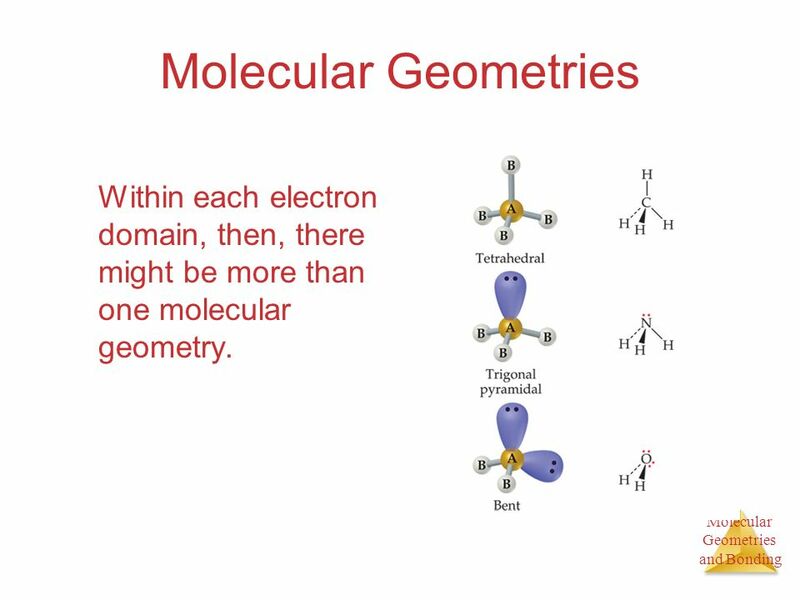 Molecular Geometries and Bonding Unit 10: Molecular Geometries and Bonding Theories Dr. Jorge L. Alonso Miami-Dade College – Kendall Campus Miami, FL CHM. 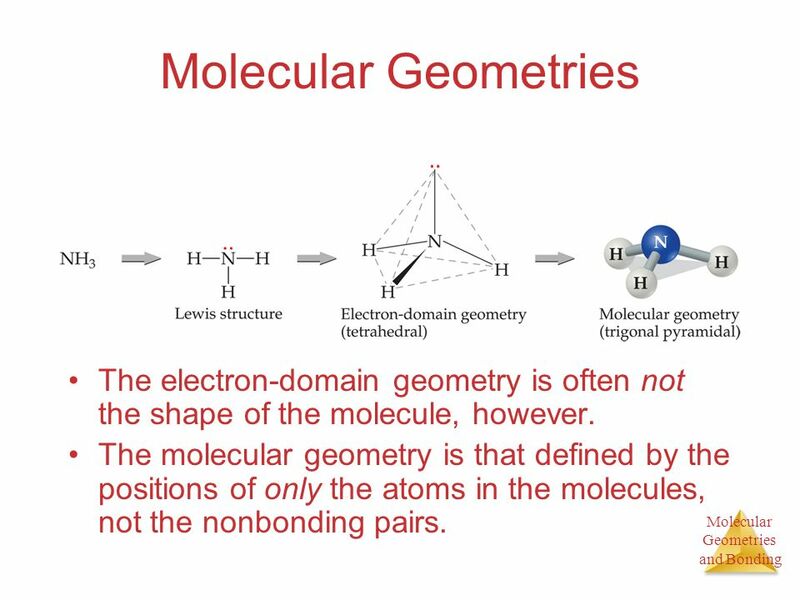 Molecular Geometries and Bonding Molecular Geometries and Bonding Chapter 9 Molecular Geometries and Bonding Theories Chemistry, The Central Science, 10th. 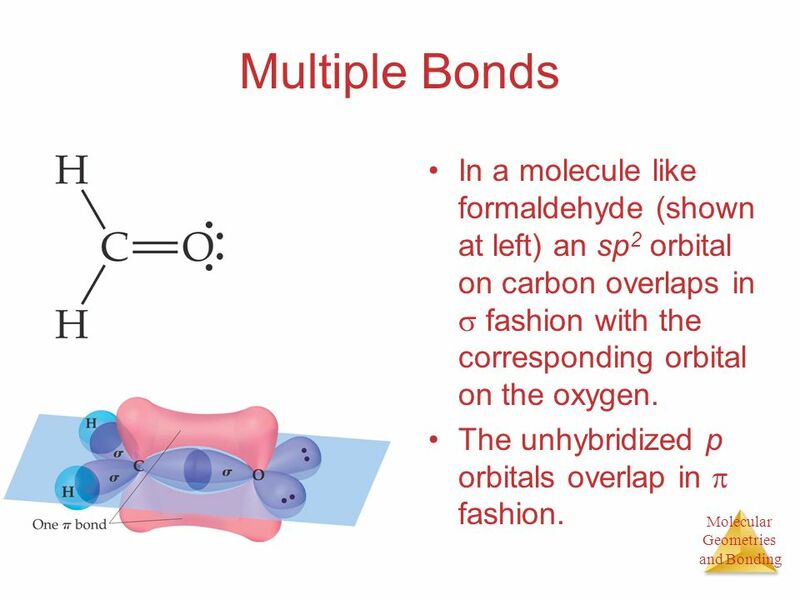 Molecular Geometries and Bonding © 2009, Prentice-Hall, Inc. Chapter 9 Molecular Geometries and Bonding Theories Chemistry, The Central Science, 11th edition. 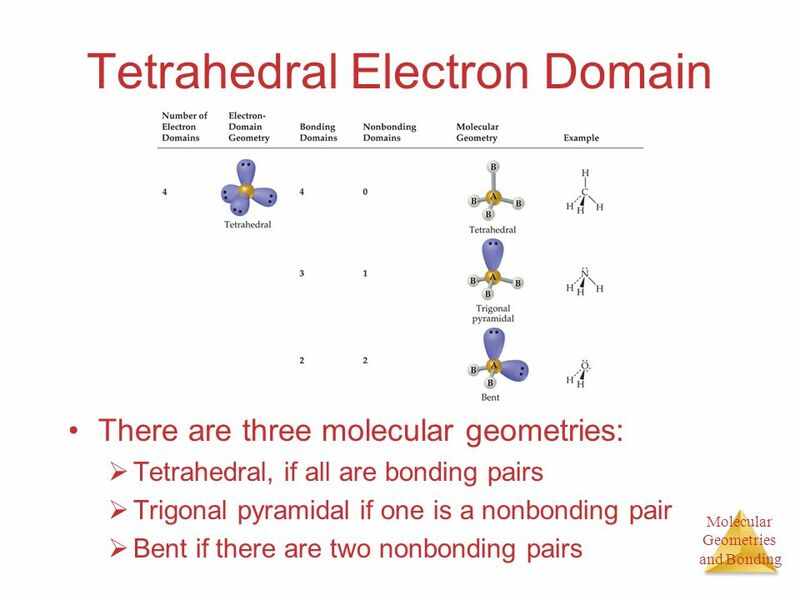 Molecular Geometries and Bonding Chapter 9 Molecular Geometries and Bonding Theories. 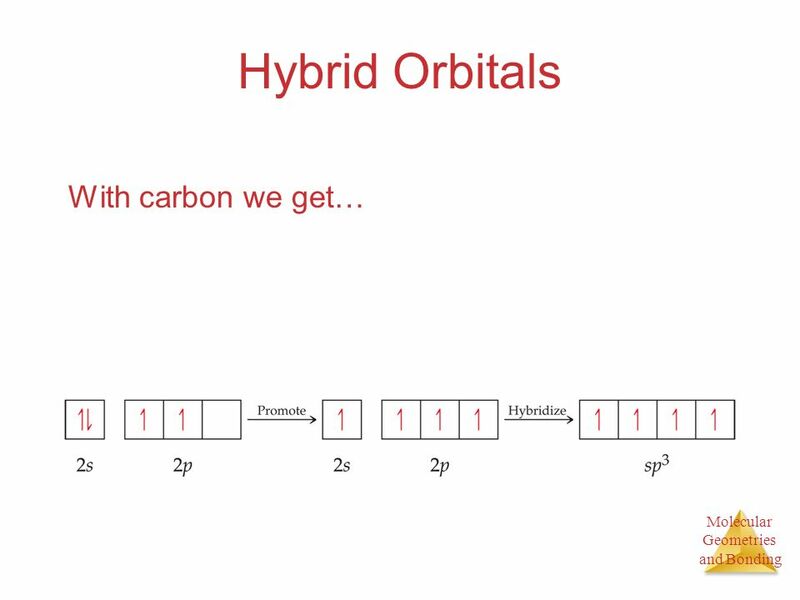 Polarity and Hybrid Orbitals Chapter 9. 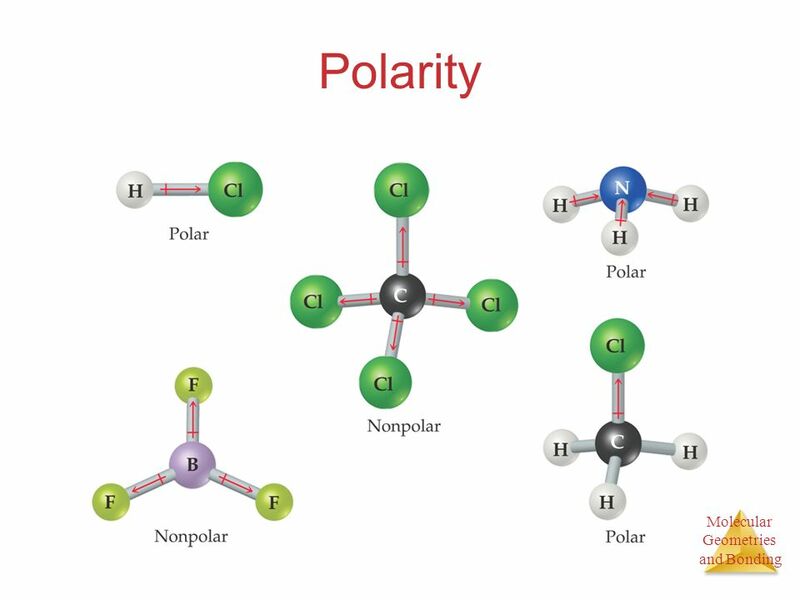 Polarity In Chapter 8 we discussed bond dipoles. But just because a molecule possesses polar bonds does not mean. 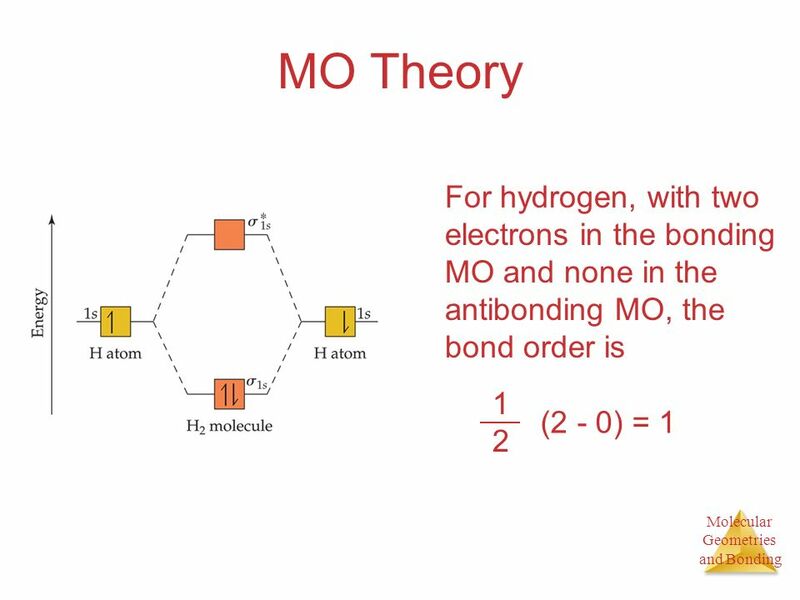 Chapter 9 Molecular Geometries and Bonding Theories. 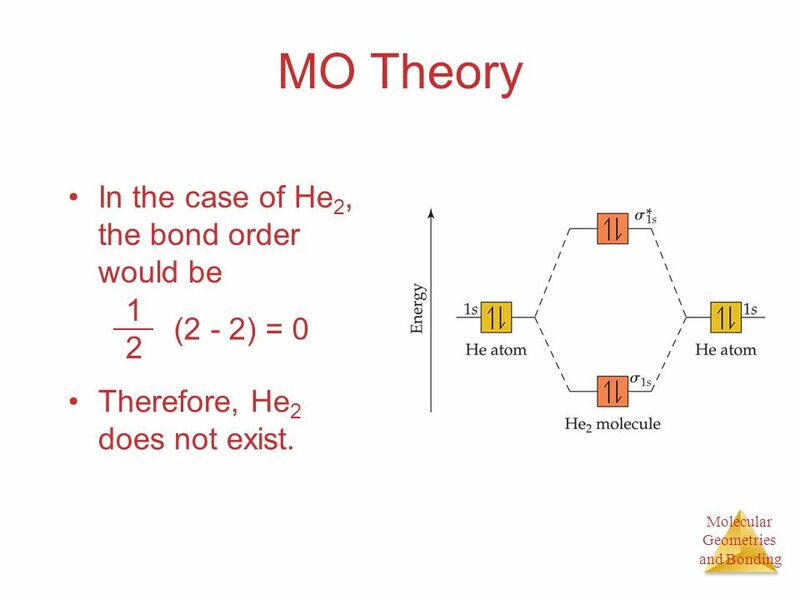 Chemistry 100 Chapter 9 Molecular Geometry and Bonding Theories.